1980s scifi is wonderful in many ways. The horrible hair cuts. The time period technology (cordless phones the size of an mailbox). Some semblance of special effects, dated as they may be. And in this case Lizards. I was mostly right. Some lizards do have trouble breathing and running at the same time. The problem seems to be centered on the mechanics of how they move their legs. 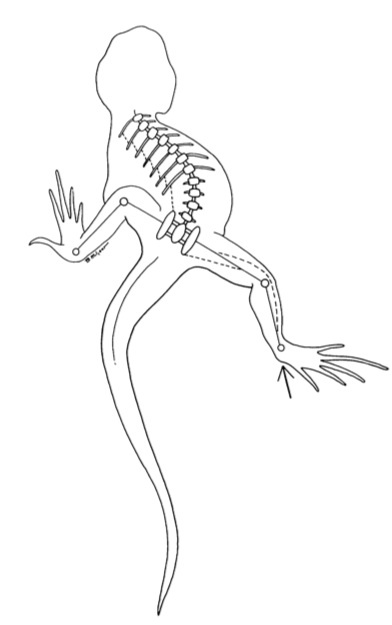 Schematic representation of relevant skeletal and muscular elements in a lizard running bipedally. During locomotion the muscles (dashed lines) of the thorax are expected to contract unilaterally, first on one side and then on the other during each locomotor cycle. Such unilateral con- traction elicits lateral bending of the trunk and stabilizes the pelvis against forces applied by the appendicular muscles. In this example, propulsive force applied to the ground (arrow) by the right hind limb exerts a counter-clockwise rotational torque on the pelvis. Axial musculature of the left side contracts to anchor the pelvis. Unilateral activation of the thoracic musculature is suggested to be incompatible with effective aspiration breathing. Modified from Snyder (1962). There you go. Apparently running makes use of muscle movement that makes breathing a tad difficult. Though I caution readers, this seems to apply to some subset of lizards. I don’t know the animal taxonomic terms very well, so it could very only apply to the small harmless ones, while the ones you’d really need to run way from have 4.2 speed. We haven’t finished V yet (it’s a miniseries) so I don’t know how things end. 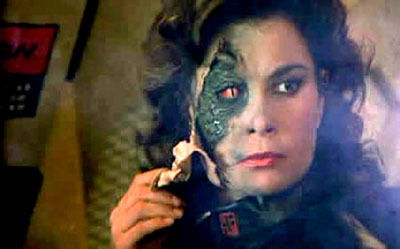 The hope, is that this applies to lizards from space.